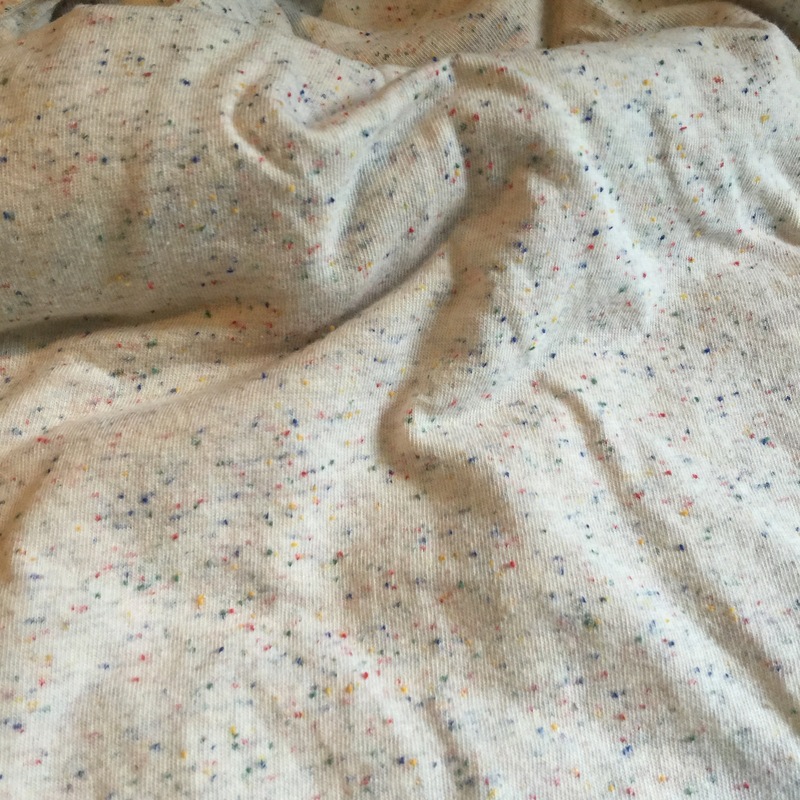 Here’s a pattern hack for a faux princess seam. 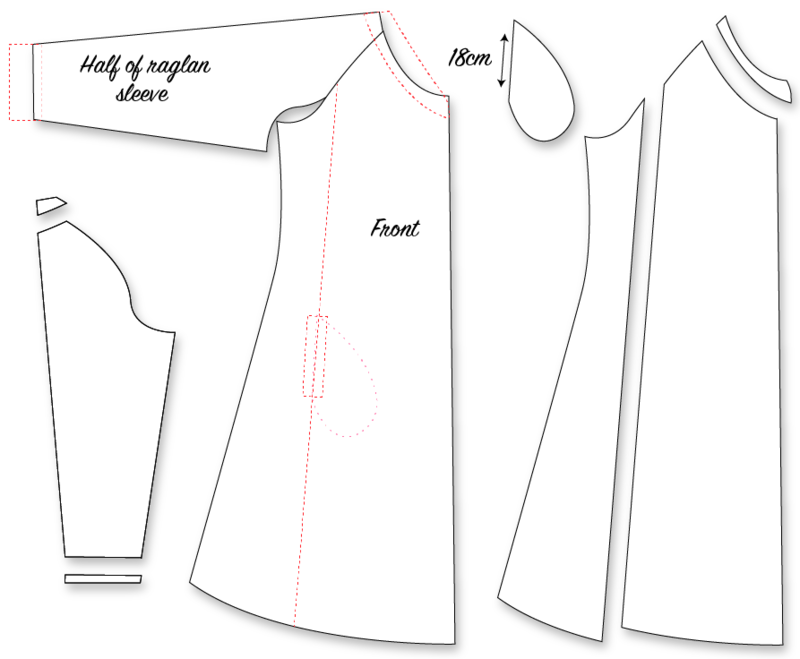 I’m still working from the A-line dress pattern, that I hacked out of this raglan T-shirt pattern. 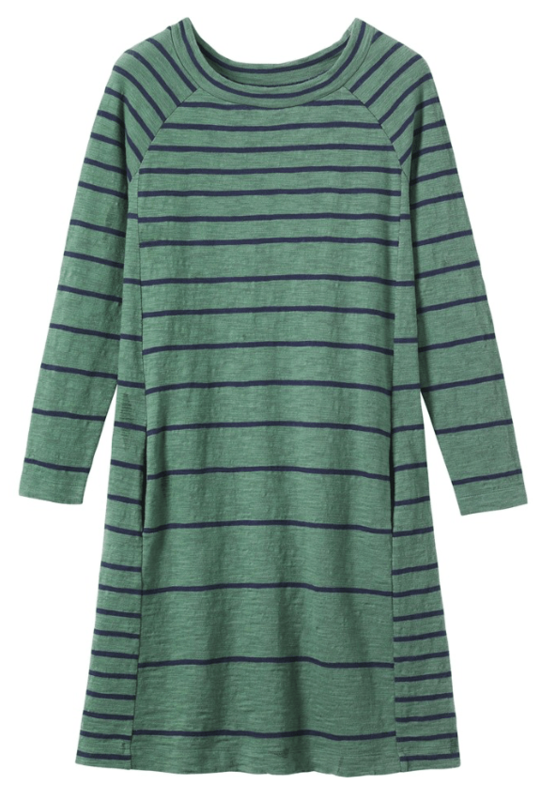 The dress above is from Toast and is made of a cotton, medium weight, single jersey. They use a nice thick jersey. 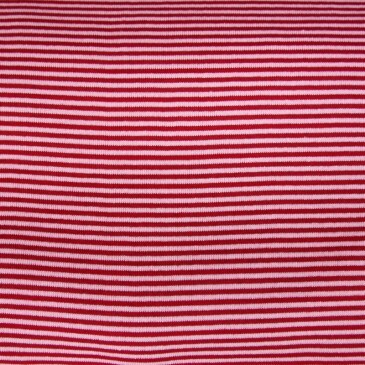 The fabric has stripes, at various distances across its width, so that the pattern can be cut with contrasting stripe panels. I want to make a pattern like this, because the side panels create flattering vertical lines where contrast fabric or trim can be added. I also like my inseam pockets to the front of my body more than around at the side seam. To begin, I make a line drawing of the pattern, as I imagine it. This helps to clarify my pattern ideas. You can see from my drawing that I plan the faux princess seams to the side of my bust point. I’m thinking of trying a contrasting ribbing at neck, cuffs and pockets. The sleeves will be bracelet length but I like to push them up higher; the ribbing will hold them place. I have a wonderful cotton jersey from Ray Stitch that looks like oatmeal with sprinkles on top. Yum, yum! I want to pair it with a colourful rib. I’ll play around, to be sure I like them together, before sewing. I’ll baste the rib around the neck before deciding if it stays. I’m unsure if I want the accent of rib as a pocket detail. It may make them pop out too much. So, this will be a play-as-I-sew project. Working from the pattern I have, I’ll add a new “princess seam line”. This won’t be a true Princess seam; it will fall outside my Bust Point and be a straight line. However, I could add a little shaping to it for my full bust. I won’t rule that out. I can draft a 3cm seam allowance along the princess seam and then decide with pins and basting if it wants a little shaping. I will plot the pocket height and draft a pocket to sit inside. 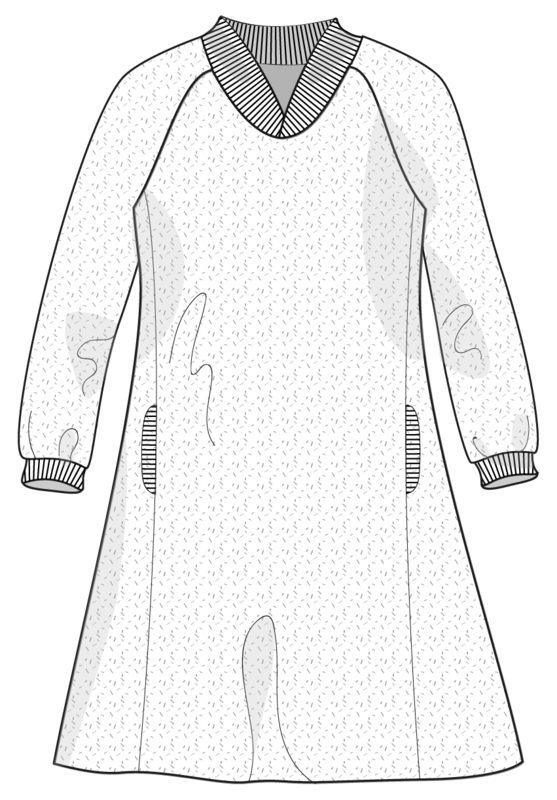 Excess fabric will be removed from neckline and cuff to allow for the ribbing. The new pieces will look something like this, once they have the seam allowance added back-in. I will also create a similar seam line for the back piece. Do you find these pattern hack tutorials interesting or useful? I put them out there, hoping they inspire people to play with patterns and manipulate them. Please let me know if I’m on the right track. 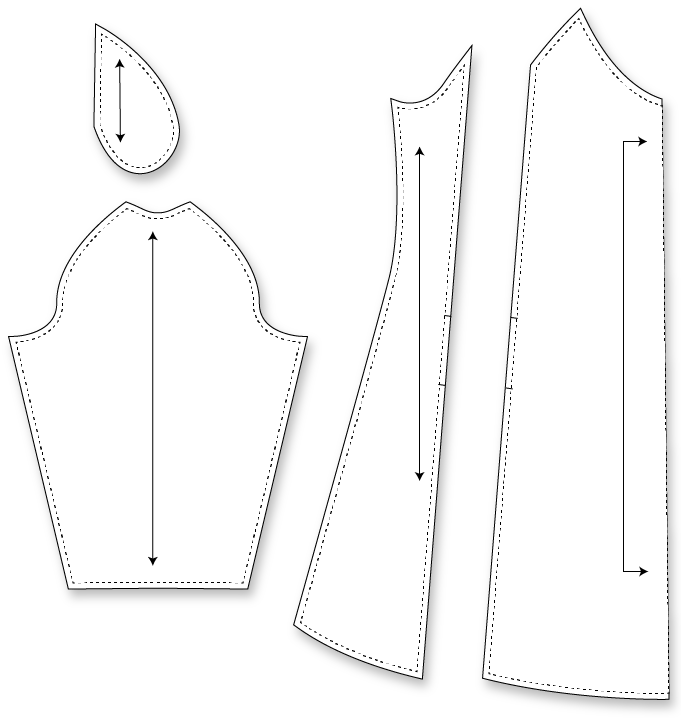 I love the shaping for the bust and shape of tunic. Not sure about ribbing at neck and cuffs. I like to see all your sewing things, and learn that you can mess with patterns to make them do different things. I am still a neophyte sewer and this sort of thing makes me think that maybe one day I can do it… Mainly I am a big chicken, though. I’m absolutely fascinated by these, please keep sharing! I’m relatively new to garment sewing and am only at the stage of “the top of this pattern on the botton of this one” and it’s great to see a proper hack in thoughts. Yes please,carry on with these tutorials. They are very helpful! Yes, yes yes…very useful,inspiring and informative, I am new to your blog, but feel I should comment,as you are taking the time and using your brain cells and I get all the benefits looking at your lovely self in your lovely creations,bravo! I can’t wait to see the end result. Thanks Brenda. I agree that it is interesting to see other people’s methods. I routinely hack all my t-shirts in a similar way so that the horizontal stripes and solids become vertical columns. It was always a pet theory that this would make them look flattering on a larger chest. Your dress will look great and yes please… share more!